I love hanging streamers and balloons in the girls’ favourite colours (obviously, there’s a lot of pink). I love making their favorite foods to share with family. I love picking out the perfect gift or planning a fun day to make them feel extra special. I love having most of our family around to gather around a table of good food and celebrate together. When my brother-in-law was diagnosed with Celiac disease a while back, I had to adjust my party plans slightly. I’ve learned to make a few staples (like these Monster Cookie Cheesecakes and this Black Forest Cake! ), and I recently added these Baked Mac and Cheese Cups to the menu as well. The family loved them. Everyone loved them. And not one gluten-loving person noticed that I had swapped regular macaroni for Catelli’s Gluten-Free Macaroni. It has the same great taste and texture and these little cups turned out perfectly! Needless to say, there wasn’t a single one left over at the end of the night. And since there’s nothing I love more than an excuse to practice my cake-baking, party-planning skills — from a great big family reunion to a small gathering of close friends — we’re celebrating Catelli’s birthday all year long. 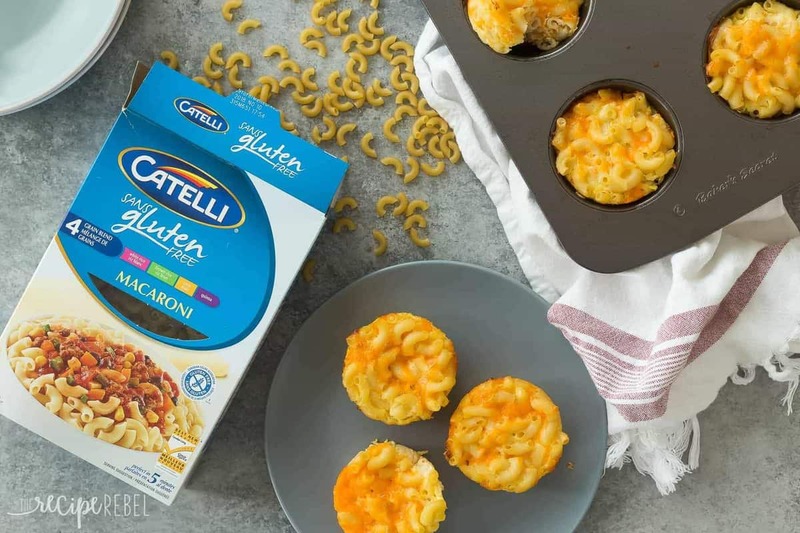 Catelli celebrates its 150th birthday this year along with Canada, and I (and the rest of the #CatelliFamilies Network) am going to be celebrating with hearty, healthy, reunion-ready recipes to share with loved ones. There’s nothing that’s as good for the soul as coming together with family and friends around a table of good food! 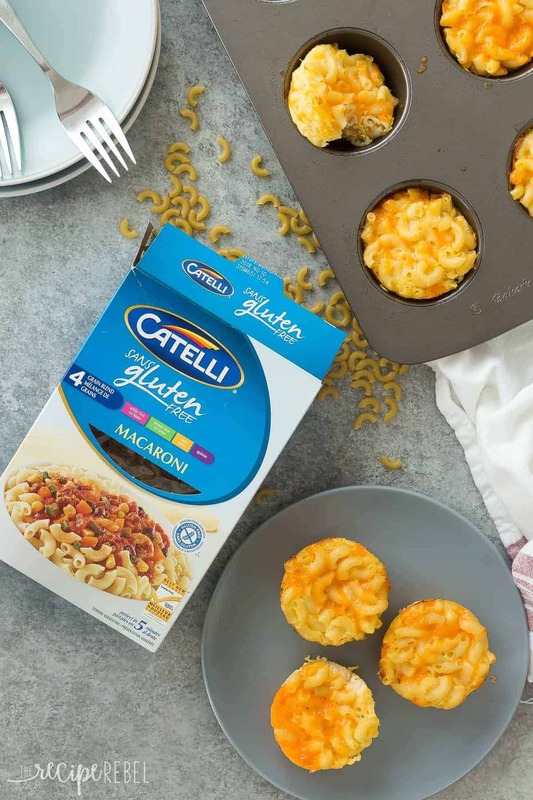 To celebrate its shared birthday with Canada, Catelli will help families across the country come together as a thank you for inspiring them over the years. The Canada-wide Catelli Family Reunion Contest is a Canada-wide contest that offers three generous reunion packages (each valued at $10,000) to be gifted to help families host their own unique and special reunions complete with a delicious pasta feast served by a celebrity chef. To enter, Canadians simply log onto www.catelli150.ca and share why they want to bring their family together. Contest is on now until April 4. 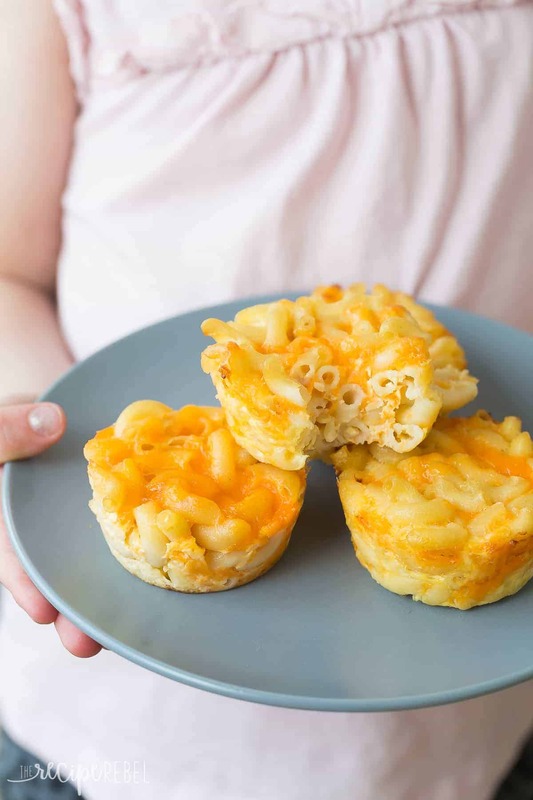 These Mac and Cheese Cups are naturally vegetarian and gluten-free — but be sure to check all of your packages to be sure. Feel free to add in your favorite veggies: broccoli, frozen peas, shredded carrots — whatever you’d add to baked mac and cheese is a go! You can easily swap regular macaroni for the gluten-free macaroni. In a medium pot over medium high heat, cook macaroni in boiling, salted water for 5 minutes or just until al dente (don't overcook!). Drain and set aside. Preheat oven to 375 degrees F and lightly grease 8 muffin cups (or use a silicone muffin pan, no greasing needed). In a large bowl, whisk together egg and milk. Stir in cooked macaroni and shredded cheese. Divide evenly between 8 muffin cups and bake for 20-22 minutes, until golden brown on top and completely set. Let sit for 5-10 minutes before running a knife carefully around the edge of the cup and removing. Serve. *To MAKE AHEAD: Prepare up until baking, cover and refrigerate muffin pan until ready to bake. The macaroni will absorb liquid as it sits, so I recommend baking within a couple of hours for best results. In a medium pot over medium high heat, cook macaroni in boiling, salted water for 5 minutes or just until al dente (don’t overcook!). Drain and set aside. *Nutrition information is estimated and will vary depending on exact serving size, types and brands of products used. [br]*To MAKE AHEAD: Prepare up until baking, cover and refrigerate muffin pan until ready to bake. The macaroni will absorb liquid as it sits, so I recommend baking within a couple of hours for best results. What a fun addition to a party! Love how easy these are! 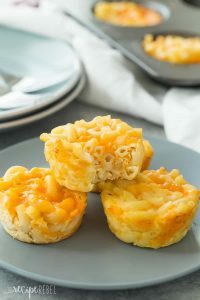 Mac ‘n cheese cups make the BEST appetizer or side dish! I love whipping them up for parties, too. Everyone loves cheese, right?! I love how how easy this recipe is, Ashley! You are reminding me that I need to make these again, and soon! They are so fun! Thanks Gayle!